Did NATO's Lost Drone Have Its GPS System Hacked By Iranian Engineers? 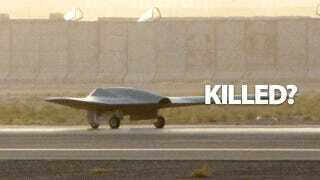 Earlier this month, NATO lost a spy drone in Iran. Initially NATO admitted that its pilots lost control of the craft, but new reports claim that the Iranian military hacked its GPS systems. The Christian Science Monitor reports that the Iranians hijacked the drone by using software that spoofed GPS coordinates, forcing it to land wherever they chose. An unnamed Iranian engineer is reported to have said that they reconfigured the GPS system of the RQ-170 Sentinel, forcing it to "land on its own where we wanted it to, without having to crack the remote-control signals and communications." "The GPS navigation is the weakest point," he continued. "By putting noise [jamming] on the communications, you force the bird into autopilot. This is where the bird loses its brain." It may pay to be at least partially sceptical about the claims though — after all, it's in Iran's best interest for us to believe they hacked the craft. And the way the engineer claims it was done raises some questions. How did they know where and when to find the drone? And doesn't the drone have other navigational systems to fall back on if its GPS systems are hacked? We're not sure. A more pernicious attack involves feeding the GPS receiver fake GPS signals so that it believes it is located somewhere in space and time that it is not... This 'spoofing' attack is more elegant than jamming because it is surreptitious.